It seems so simple, but many Americans were never taught how to balance a checkbook with a pencil or fill out a tax form. We can learn how to conjugate verbs in English class or how to floss at the dentist, but good financial practice is something that you simply pick up along the way. The same goes for credit cards. 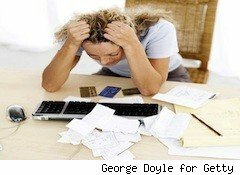 When you sign onto your online account page for a major credit card company, you're confronted with a barrage of daunting numbers.Capital One, for example presents you with Minimum Payment, Last Payment, Balance, Payment Due Date, Available Credit, and Account Number. That's a lot of numbers. But it's pretty clear, after a moment of reflection, that "Balance" is the amount you ought to be pay if you don't want to stay in the red. But when you sign onto its website, American Express pelts you with Statement Balance, Recent Payments and Credits, Recent Charges, Outstanding Balance, and Payment Due. But when you click "Pay Bill" on AmericanExpress.com and prepare to make a money transfer to settle your affairs, guess what? Some of those numbers disappear. And one of those numbers that is no longer visible is the very number you should be paying off: Outstanding Balance. Instead, American Express confuses consumers and gives them only two options: Minimum Payment Due and "Current Balance." After that, there's a blank box for a write-in amount. Because Current Balance is the higher number on that Pay Bill page, many customers surely assume it's all they owe, or they click it out of convenience. But don't be fooled into thinking that American Express' Current Balance is your "Outstanding Balance," because it's not the same thing. If you made any charges in the past few weeks, since you got your last bill, they won't be included. In fact, that Current Balance number went by an entirely different name on your Summary of Accounts page, just one click ago: It was your Statement Balance. As the site's pop-up window explains, it's the "amount in the total balance showing on your most recent billing statement." Still confused? I would never accuse a for-profit financial institution of devising subtle ways to part you from your money, but if you accidentally paid a lower amount -- the Current Balance instead of your Outstanding Balance -- American Express would potentially stand to gain in fees and interest. A moment of deliberation, and a sober confrontation with the reality of your account health, is required to know which number to pay so that you'll keep out of further debt. When you sign into American Express' website, grab a pen and write down your Outstanding Balance. That's the number you're really working with -- particularly since American Express cards are traditionally supposed to be paid off in full monthly -- and ideally, that's the figure you want to fill into the blank white box on the Pay Bill page. You won't see that number again despite the fact it's the number required to settle your account in full.